As much as I bash the Lasers, it is a class I enjoy supporting even if I don't enjoy racing them as much as I did long ago. Again this year, I volunteered as Vice Chair for Severn Sailing Association's spring Laser bonanza, the Sunshine Open Laser regatta, or SOL; held this past weekend. On Sunday, the breeze came up with the sun, the wind was was blowing hard through my dogwood blossoms when I pulled out of my driveway and was definitely howling through the rigging as the Lasers rigged up at SSA. Conditions looked very marginal but once on the water the breeze moderated throughout the day and not too much mayhem was seen on the course. We eventually got four races completed in a shifty Westerly breeze that ended up more to the South by the end of the day. It was an older Laser crowd out for this mid-April regatta... I have no idea where the fit and ready 20 something Laser sailor was, but they weren't in attendance for this regatta. A fair number of older geezers were in the Laser radials and they had a much closer battle going on within this fleet (compared with the Standard fleet), even though the skipper weights probably ranged from 130 lbs to a whopping 200 lbs. Finally the 4.7's were right in the thick of things with the Radials when the breeze was up. Another report and results from the District 11 website can be found over here . Skipper 14; What the Heck is That Paul? Around the beginning of March, I got a call from Paul Weiss, another International 14 buddy from the 1970's - 1980's who I haven't heard from in a while. We worked together on an International 14 design in the late 1970's (truth be told - it was more Paul's design in the final version). Paul was working with some nascent computer hull design software for the Navy (on some ancient hardware - maybe a VAX.... talked to Paul and he said it was a PDP which was DEC's earliest high end computer) and I would wager this International 14 was probably the first dinghy to be designed by a computer. We would build cardboard models from scaled hull panels drawn out by the computer (this was a multichine plywood design). Paul eventually built the Weismin Mk1 which turned out to be very good in light air, not so good in a breeze. Well, Paul (and wife Gerri) invited me and the missus over for a St. Paddie's day ham and cabbage dinner and I took a look at Paul's latest Craigslist freebie boat project. Paul told me over the phone that he had picked up a Skipper 14 for free. There are probably ten people in the U.S who know what a Skipper 14 is and I'm one of them. You see, my Auntie Doris knew of my love of sailing and sent me the English "Yachts and Yachting" magazine throughout my teenage years. As a result, I'm more knowledgeable about English dinghy classes than I am about American classes. And I've always felt the Skipper 14 was a superb multi-purpose dinghy design, though small by American tastes (we like our 19 foot Flying Scot's). 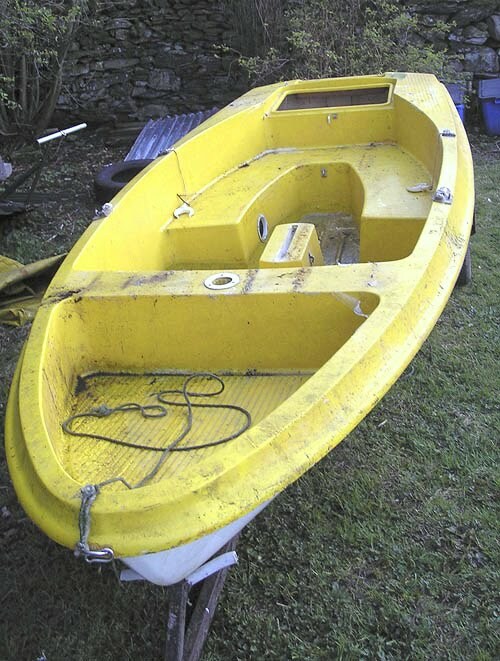 The Skipper 14 was designed by Peter Milne in the early 1970's (Peter Milne being the designer of the very popular Fireball dinghy) and was built in England by Richmond Marine. The Skipper 14 featured deep freeboard with a very complex deck molding for that period, lots of fancy molded wells and seats. Paul is currently hard at work on his Skipper 14 replacing various rotten plywood bits but I expect this one will get in the water sometime this summer. Hopefully I will have a sailing report later on. And here is Paul's project Skipper 14, safely ensconced in the garage, serving as a storage holder for a stuffed hammerhead shark! Back in the 90's, I took a kayak tour on Elkhorn Slough, off Monterey Bay, California, and came across another Skipper 14 launching off a public launch ramp.... so I know now of at least two in the U.S. This blog doesn't go overboard to elicit comments to posts but let me emphasize that I appreciate all your comments (and now that I have finally figured how to track them through Blogger); I read them all. Since I'm not the most prolific commenter to other blogs, I don't expect much in return but many thanks to all who respond to my posts (TOH to the recent comment on my Patin A Vela post, TOH to Doryman, Tillerman, JohnZ and My2Fish, the most prolific commenters of my small but treasured readership). It may have escaped the mainstream sailing press, but Russell Coutts is singlehandedly remaking the top end of our sport. I have no doubt Russell is the main reason the America's Cup is now competed in cats instead of monohulls. Sailgroove.org has put this fascinating interview with Russell up on YouTube and I get the feeling he is not satisfied with how this sport is run. (Let me say, I like where Russell is going with this). Not surprisingly, at the moment, Russell is concentrating on the professional sailing scene but his long range plan is , one way or the other, to definitely get sailing stuck in the minds of the non-sailing public. Music Whenever: Broken Bells, "The High Road"
Broken Bells - The High Road from Phunk Promotion on Vimeo. Chris Hale of the U.S built a Bunyip IX scow hull several years ago and a slideshow was made of his photographs. This video dovetails nicely with Ray Hilton's plans and building instructions. The Australian Scow Moth is one of the most exciting chapters in the history of building wooden racing dinghies. With the pressure cooker of constant hull development, builders were able to get the scow hulls below 40 lbs (18 kg) by paring away structure, till, all that was left was the essentials. Scow Moths were built like airplane wings; a very light skin (1.5 mm or 1/16" ply) supported by ribs and strategically placed bulkheads. Ray Hilton, of Western Australia, designed and built scow Moths for his sons, Greg and John, through the 1970's to the mid 1980's. In 1982, Greg Hilton was the last Moth sailor to win a World Championship in a scow. Ray's Bunyip IX design (and the Ian Ward's, Jim French's, Andy McDougall's scow design) is where wooden Moth scow development stopped as the skiff hull in mid 1980's was rapidly outpacing the scow in International Moth competition. More readable station offsets for the Bunyip IX can be found here. Some pictures of Aussie scow Moths can be found here. Australian Mark La has taken the Bunyip lines and made a flat-pack kit. Plans for the 1940's Len Morris scow Moth can be found here. Whenever I run into a dry spell for my "Music Whenever" section of "Earwigoagin", I turn to my daughter Robyn for help and she doesn't disappoint. tUnE-yArDs - Bizness - Official Video (Director's Cut) from mimi cave on Vimeo. Seahorse Magazine waxing lyrical about Classic Dinghies; What's Up With That? "There is now a thriving historic 18ft skiff scene in Australia with fierce competition and entries from several of the different Commonweatlth nations ............... In fact, historic small boat racing seems to be on a roll everywhere right now - there is only so much white plastic anyone can take." I would like to say "No sh*t Sherlock" but let's be nice, and congratulate Seahorse magazine on finally spotting a trend that this blog has been on top of for a while. It may be the greying of dinghy racers that is driving this trend but there definitely is exploding fleet racing in everything from the our local historic classes, the Chesapeake 20 and Log Canoes, to the Salcombe Yawls in England, to the Rainbow keelers of Holland et al. I'll be starting a series soon featuring current gaffer and gunter classes that are still going strong. A YouTube video on the Aussie 10 footers can be found here.